Yonatan's Mum, a regular customer and a dear friend of mine, told me months ahead of time that she wanted an album for her son's Bar Mitzvah. Yonatan's brother celebrated his Bar Mitzvah back in 2013 and Mum knew that she wanted an album for her second son as well. Yonatan is mad about Chelsea FC, loves playing tennis, adores sushi, and Mum thought I should include his phone on the cover too. She also liked the tefillin (phylacteries) that I had given his brother, and wanted me to show Yontan wearing them as well (Jewish men start wearing tefillin just before their Bar Mitzvah). I have shown spiky-haired Yonatan wearing his much loved Chelsea shirt, with a tennis racket in one hand and his phone in the other. He is wearing tefillin on his head, on his left arm, and the straps are hanging down over his shirt. (Tefillin consist of two leather boxes with parchment with biblical passages inside. The first one goes on your arm, the second on your head. A right-handed person, which Yonatan is, places tefillin on the left arm). There is a plate of sushi and some chopsticks to his side. The green background box matched the colour scheme of the Bar Mitzvah celebration. (I'm going to give another well-deserved shout-out for the wonderfully talented Ruti of Designed by Ruti who created some incredible blue and green balloon centrepieces which the album matched perfectly!). Yonatan's name, the word Bar Mitzvah and the date of the Bar Mitzvah celebration are written in Hebrew. On the first page of Yonatan's album I added some teeny-tiny sushi (yum! 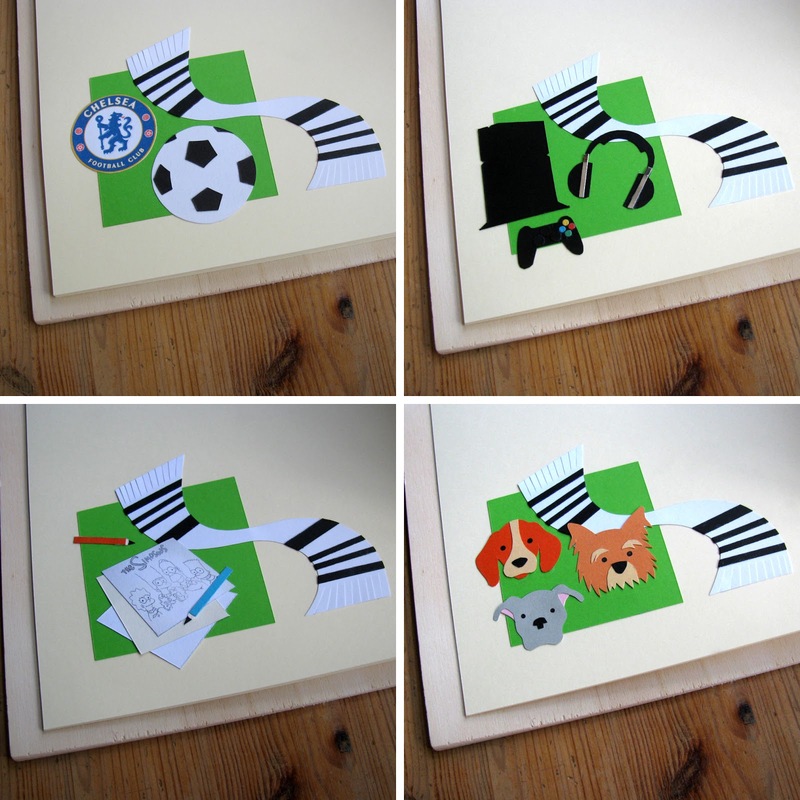 ), then the next featured Chelsea's club badge and a football. 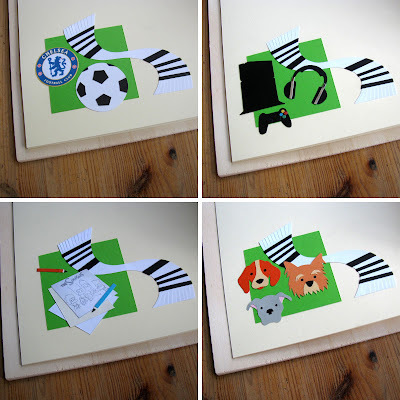 Another page showed his earphones (just like on the card I made him when he turned 11) and the PlayStation console and controller (which also previously featured on his older brother's 14th birthday card!). Yonatan is a great illustrator and enjoys drawing cartoons like The Simpsons. For the next page I added some paper and pens and, with a little work on Photoshop, made sure that a Simpsons sketch was displayed on the top of the pile. Lastly, Yonatan loves dogs - all dogs - so the final embellished page in his album showed some cute little mutts. I had great fun creating them! My lovely friend was delighted with the album and Yonatan loved it too. "I absolutely LOVE this! It's perfect!" she wrote to me. "You are so talented!" It's not always the case, but I am so lucky to often have such enthusiastic customers! And I made a card for Yonatan too, to match the colour scheme of his Bar Mitzvah celebration. it's really beautiful. lots of lovely personal touches. You are indeed talented. Wow! It's so nicely made with incredible details. I think my favorites are the mutts. Aphrodite's rock is especially impressive! I would love to visit there.